Meet Marilyn Davenport, volunteer PR expert for the DBA, owner of Mad Dawg Marketing, specializing in marketing and PR for food, restaurant and small businesses, and beer expert at In Season Local Market. Cheers! 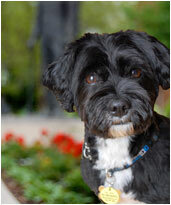 Rescue dog Shilo Weise, a 23 lb. Shitz-Poo, loves her new home. Her favorite things about Historic Downtown are: Italian ice, the water bowl outside of Vics, and barking at buses. Creations features exceptional fine art plus unique jewelry and a wide range of affordable gifts produced by regional artists. The owners, watercolorist Vickey Swenson and Tom Parsons, chose their location because, Tom says, “Main Street retains that home town ambiance that invites people to mingle and browse.” We couldn’t agree more! Email for more information. Enjoy great local food, information booths, an arts and crafts fair, the "Louis-Palooza" concert at the Steinbaugh Pavilion, and the 2nd Annual Taste of Louisville 5K/Half Marathon. Rise and Shine, Here Comes the Farmers Market! Receive a free market bag and check out the new farms: organic and non-certified, ready to-go food, breads, wine, massage, pasta... so much more! Plus music at the Steinbaugh Pavilion. 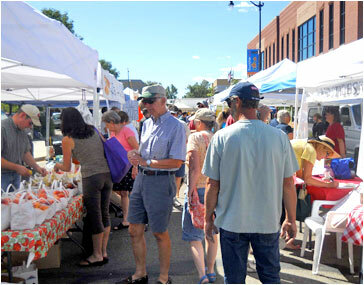 The market will run every Saturday through mid-October from 8 am – 1 pm. Local food is good, but local spirits are even better! In Season has expanded their market to include Colorado craft beers, artisan wines and spirits. Now you can pair the great local cheeses, meats and other goodies in the store with carefully chosen handcrafted beers and wines. There will be tastings every Saturday and the doors will stay open till 8 pm on Fridays and Saturdays. History Brown Bag: "Louisville Celebrations: Holidays, Parades & Festivals"
Immerse yourself in Louisville history! This informal Brown Bag presentation by Museum Coordinator Bridget Bacon will explore this aspect of Louisville history through discussion and historic photos from the collection of the Louisville Historical Museum. Participants are welcome to bring their lunches! Chef Deb of Mountain High Appliance presents her Summer Series of Classes, “The Primer for Farm-to-Table Cooking.” First class is “Grilling our Side Dishes.” July class “Mid-Summer’s Night Dream – Dining Alfresco with Little to No Cooking." Chef Keith Jones, former Executive Chef of Mountain High Appliance, and popular TV EATERTAINMENT Host, has come back to teach demo-style Asian Summer Bounty... Summer is more than Vegetables. $15. RSVP. The GRILL OFF continues with seven ultimate grills and the culinary skills of amateur Chef/Reps. Complete with kegs and specialty beers. 5:30 – 8:30 pm. $20 for all you can eat or drink. RSVP two days prior to the event. Special prizes, discounts, free classes and a photo shoot with Peggy Dyer’s One Million Faces Project. Don’t forget new family and Mommy and Me classes. More information. Join nearly 30,000 commuters in the Denver region’s largest annual bicycle commuting event. Bike to Work day is sponsored by the Denver Regional Council of Governments (DRCOG) to educate commuters about the health and environmental benefits of bicycling. 36 Commuting Solutions is a nonprofit organization located in Louisville with the mission to enhance mobility for commuters along the U.S. 36 corridor for today and the future. Pack a picnic and bring the family to the 2011 Summer Concert Series at Community Park. FREE music for all ages and musical tastes. Sit among your friends and neighbors and savor the many sounds of summer. Watch the dogs, watch the kids and kick back. LCC events are sponsored by the Scientific and Cultural Facilities District.